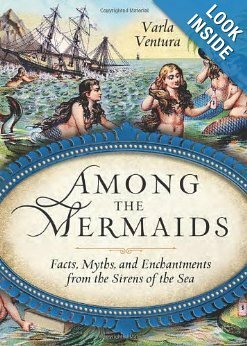 'Among the Mermaids' is an enchanting collection of classic stories, facts, and tales of mermaids from around the world that will thrill every lover of this romanticized mythological creature. Compiled by 'Book of the Bizarre' author and magical creature devotee Varla Ventura, 'Among the Mermaids' includes turn of the century tales of merfolk from Bret Harte, Crofton Croker, and W.B. Yeats, along with tantalizing trivia, facts, first-hand accounts, and speculations about mermaids in popular culture. We, Mermaids Cove, are even recommended in "The Tail End of This Book" as one of Varla's favorite places to shop! Caution.....some accounts of occurences may curl your tail! !